It is an event not to be missed Thursday, September 19th at Marsiglione Arts Gallery, that will open its doors at 18.30 to contemporary art lovers and not only for a national preview, the presentation of “The body and the pain through the centuries”, the art project conceived and organized by the gallery director, Salvatore Marsiglione, with Giancarlo Marcali milanese artist that since 2007 has exhibited his works in Italy and abroad, with considerable success with the public and critics. A solo show that approach the comparison of the works executed by the artist especially for the event with some classic artworks through the centuries and offers the viewer a unique approach with the language and content of the art of Giancarlo Marcali. Giancarlo Marcali develops his artistic research in a painful process of investigation of the moment. How many types of pain are tearing the human being? Infinite as the abyss of the soul. But they all leave a trace of their passage, a scar, visible or not. In spite of our differences, Giancarlo unites us all by virtue of our common essence, for the matter of which we are composed of light, reminding us that despite long distances we have a common origin and that the pain of everyone has the right to be expressed. It’s a compounded pain that does not seek the dramatic moment. It is the emphasis release of a man no longer prisoner of his own and others’ fears that opens up with trust to others, showing the wounds of the soul. Finally, he learned that a pain shared is halved. The exhibition opens with the transfiguration of a Venetian San Sebastian of the end of the fifteenth century, which, through the contemporary language of Marcali becomes female, transparent, inner and expressive. Next, installation of signs in which the artist re-writes a poem by Tony Fournier transforming it into forms that convey the succession of three stages full of pathos defined by a single female figure enclosed in three caskets and consists of pins. Perte, douleur, renaissance, this is the name of the installation to which Giancarlo combines the three expressions of “Sophonisba receiving the poisoned chalice” a copy of the eighteenth-century baroque masterpiece by Simon Vouet, preserved at the Museum Schloss Wilhelmshöhe in Kassel, Germany. The exhibition then opens the vision of Ri(e)volution, installation built with X-rays reprocessed in digital format , that expresses the strength of the artist’s conceptual soaring, light and delicate in its characteristic shape of a winged skeleton. Presented, for the occasion, with, at his feet, a female sculpture in a classical style, the installation provides a reference to the sacred imaginary of the Annunciation, where the sculpture idealizes the Blessed Virgin Mary and the winged skeleton the Archangel Gabriel. Further, a French press neoclassical very raw and full of suffering that describes Michelangelo blind in his studio in the act of embracing one of his sculptures from the masculine musculature, is flanked to the delicate transparency of Ritual of my legs, which features a female figure in shades of pink in the same position of Michelangelo’s sculpture, “enclosed” between the gloss of a mirror and the dark shadow of a radiographic image of a leg, the femur and the tibia, is engraved with a poem by Pablo Neruda which gives the title of the work itself. Next is the path to the “Dying man”, a work that will be published in the second volume dedicated to self- portrait by art critic Giorgio Bonomi, a re-reading of a drawing in pencil, dated 1944, of the great Maestro Luigi Russolo: the “snapshot” of the essence of the moment before his death, that death, which marked the search of Marcali. 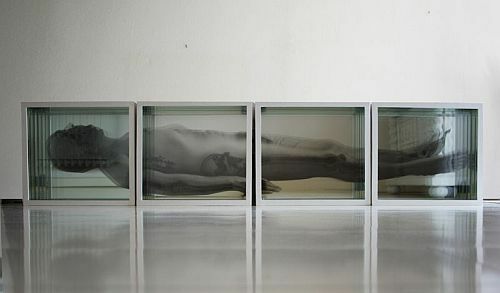 A work full of tension and drama of quiet: an installation created with stratified X-rays, the naked body of Marcali himself, a body raised in light, content and serene. “The memory of the pain is the container body that can accommodate the experience and evoking its testimony, to convey harmony through the sharing of pain (Giancarlo Marcali)”.